The user management tool allows you to add additional administration users to LimeSurvey. We will just call them 'users' in this chapter. Do not confuse them with survey participants (respondents). To create a new user, open the user management dialog by clicking on Configuration (located on the main LimeSurvey toolbar) -> Manage survey administrators as shown below. Enter the desired username into the Username text field. LimeSurvey sends out a confirmation email to the address entered into the Email field. This email address will be used as the standard contact email address for surveys created by the respective user. Enter user's full name into the Full name text field. Please note that the full name entered here will be used as the standard contact person name for surveys created by the respective user. Click Save to create the new user. You have now created your first user. To find out more about setting user permissions, please continue reading further. set template permissions for a user - click the pen-and-lock symbol. You can use the pen symbol to edit a user. You can set a new email address, full name, and even change his or her password. If you have finished what you want to do, click on the Save button (right upper part of the window). To delete a user account, simply click on his or her corresponding trash button (located on the same line with the user account you want to delete) and click OK. Global permissions apply to the whole LimeSurvey installation. If you want to set permissions only for a specific survey you can use the survey permissions settings. To set global permissions for a user, click on the lock symbol. The CRUD (Create, read, update, and delete) system is employed (like in the survey permission settings). To fine-tune user permissions, we strongly recommend to extend the matrix using the double-right arrowhead, which is located in its upper right corner. If you check the first box, all the CRUD permissions situated on that row are automatically checked. Participant panel: For more details, continue reading about the central participant database here. Label sets: Permission to create, view, update, delete, export, and import label sets. The label sets don't have specific permissions (unlike design templates). Settings & Plugins: With this permission a user can check data integrity, save the SQL database to an .sql file, manage global setting, view the PHP info in the global settings, and manage all plugins. Surveys: This gives access to all surveys. To allow a user only to create and manage their own survey survey, only give the user the 'create' permission. A creator of a survey is the owner of the survey and will always be able to manage it. Remember that each survey can grant to users different permissions. The global permission is applied before the survey-specific permission! User groups: This permission allows a user to create/view/update/delete user groups. Users: A user can create, modify, and delete his own administration users with this permission. The newly created users cannot have higher permissions than the parent user. You will also not be able to edit users owned by other administration users. If this has to be done, then a Superadministrator permission has to be granted. Superadministrator: This permissions can only be added or removed by the user called admin and grants full permission to the whole LimeSurvey installation. Warning : This permissions is very powerful and you should be very careful with granting it. Use internal database authentication: This permission allows users to access LimeSurvey's panel via the authentication page (e.g. http://domain/admin/authentication/sa/login). If it is unchecked and the respective user tries to connect to the LimeSuvey's panel, he will get the following error: 'Internal database authentication method is not allowed for this user'. With template permissions, you can decide which design templates a user can select when creating or editing a survey. It might be a good idea to restrict the design templates a user can select in order to prevent unwanted use of design templates, which you might consider to be not suitable for a survey/questionnaire. For example, if you have a specific design template for a group of users or customers, you might want to restrict their access to other templates to make them use only the template created for their purpose. Select the design templates to which the respective user or user groups should have access to. After you finished your selection or deselection, do not forget to hit the Save button: . To get a proper understanding of this function, check the examples provided below. 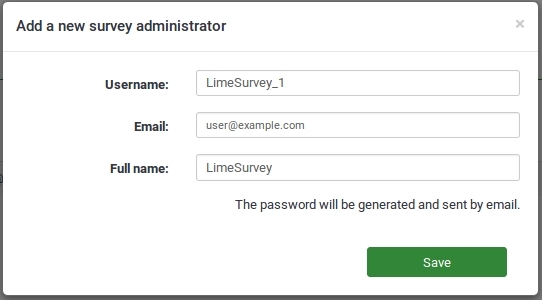 A user can call the LimeSurvey login at /limesurvey/admin and enter a username and a one-time password (which was previously written into the users table - column one_time_pw - by an external application). To enable this login method, the line $use_one_time_passwords = false; has to be set 'true' in config.php (it is 'false' by default) . Maybe you can set it like " 'use_one_time_passwords'=>true " in the 'config' array in config.php , don't forget the ',' symbol. user: The username normally used to login into LimeSurvey. This username has to exist in the 'users' table of the database. secretpassword : it is the plain text , not the MD5 code . To enable this login method, the line $use_one_time_passwords = false; has to be set true in config.php (it is 'false' by default). The passed username has to exist in LimeSurvey's users table. The one-time password (which can be set via an external application) has to be stored as MD5 hash in column one_time_pw of table users. (This should be ignore except "Both passwords have to match")The passed plain text password will be hashed using the sha256 function and will then be compared to the stored hash in column one_time_pw of table users. Both passwords have to match. After the first login with the one-time password, it gets deleted from the database. The user won't be able to log in anymore with that respective password a second time. My local LS system can't test the permissions with different accounts . (My E-mail password do not have a way to be getted). These permissions only apply for a single survey. If you want to set permissions for the whole system, you can use global permissions. These permissions can be offered either to a single user or to a user group. Attention : An existing user account is required to set permissions for a single survey. If the account doesn't exist, you have to create it first and then change the survey permissions. The same applies to offering survey permissions to a user group. Besides the necessity to have one created, you also need to add at least one user to that group in order to be able to select it and grant it survey permissions. To change the survey permissions, you have to select the Settings sidebar of your survey. Then, click on Survey permissions and choose to whom would you like to offer permissions. The rights can be offered either separately to specific users or to a user group. In the next step, select the user that will receive survey rights and click Add user. After you click Set survey permissions, the user's survey permissions matrix will be shown. You can set in this matrix the user's survey permissions. Checking a box grants survey permissions to the respective user. If you click on a checkbox from the first column, all the rights of the corresponding line will be selected/removed. Click on the double-right arrowhead to access the extended version of the matrix to choose specifically the actions that can be performed by a user. After you finished editing the survey permissions, click on the Save button, which is located in the upper right part of the screen. Some examples are provided below in order to help you get a better understanding of the Limesurvey's survey permissions system. Click on add a user group and select the user group to which you would like to add the permission rights. You will select in the next step the permissions that you will allocate to the members of that user group. Do not forget to click on the double right arrowhead to get an extended view of the permissions matrix. After you finished editing the survey permissions, click on the Save button, which is located in the upper right part of the screen. The user group function is still experimental. Use our bugs tracker to describe any kind of inconsistencies. Different scenarios are presented below. They provide some advice about which rights are necessary for some specific tasks and how they can be granted to the users. Grant that user the Superadministrator permission. Not necessary : Setting the template permissions (Superadministrator has all permissions for all templates). Not necessary : Setting the survey permissions (Superadministrator has all permissions for all surveys). Log in as admin (or as a user that has the Superadministrator permission). Set global permissions for that user to Create survey. Optional : Set template permissions - select which template(s) should be used by the user/user group. Set no global permissions for user. Set no template permissions for user. Set the survey permissions the way you want. If he/she should receive all the survey permissions, you can check the first box from each row. Otherwise, click on the double-right arrowhead to see the expanded matrix (upper right corner) and select only those rights you believe the respective user should have. Set survey permissions to: Responses -> View/read and export, and Statistics: View/read. Create n user accounts (where n is the number of translators). Create a user group called Translators and add the n accounts to this group. Go to the Survey permissions and click on Add a user group. If they do only translations, then offer them the Quick translation permission. Check our wiki section on users and their classification as it can be found in the code and documentation.